RecordsKeeper’s blockchain-centric solution is built to store, share, and manage your information in the safest fashion. Once your data is on the RecordsKeeper blockchain, it cannot be deleted, tampered with, or modified even by the data owner. RecordsKeeper offers a rich set of features including extensive configurability, rapid deployment, permissions management, native assets, and data streams. 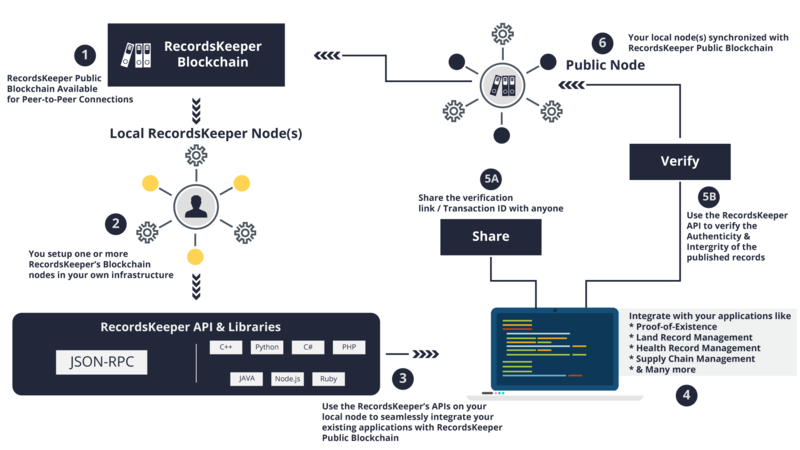 There are several use cases for RecordsKeeper ranging from KYC verifications, supply chain management, manufacturing, health record management, academic certifications, and employment credentials verification. 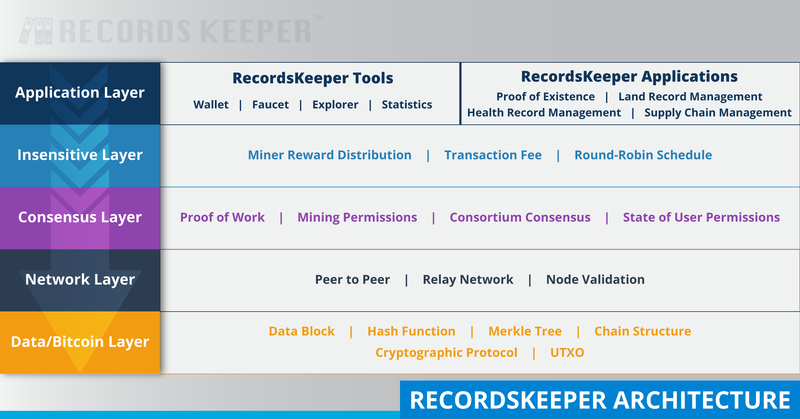 The ecosystem for RecordsKeeper includes different layers which provide the building blocks for the RecordsKeeper blockchain. The different layers, as shown in the diagram below, interact with each other to form the public, minable database on the blockchain. RecordsKeeper was founded by Toshendra Sharma and Rohendra Singh in November 2016 and includes a team of blockchain developers, and marketing veterans who share a passion for blockchain technology and believe in collective shared information and data. RecordsKeeper is based in Singapore with offices in India. The team at RecordsKeeper has created an open-source, immutable, public database using blockchain technology which is available to millions of users to store and share data, and currently a new block of data is being created every 15 seconds. The best way to get familiar with RecordsKeeper is to try the Demo . The Demo allows you to create a new wallet and store data on the RecordsKeeper blockchain. It also allows you to retrieve the data and verify it. On the next pages, we will see how to use RecordsKeeper to store data followed by the basics about RecordsKeeper mining and how to set up your network. The next section will explain several features of RecordsKeeper. You can implement and deploy your own solutions on the RecordsKeeper blockchain. The last section will cover important aspects and use cases of RecordsKeeper in depth. If you still have questions, you can try searching or asking on the RecordsKeeper FAQ, or come to our Telegram channel. Ideas for improving RecordsKeeper or this documentation are always welcome! Is RecordsKeeper a storage, database, or blockchain? How is RecordsKeeper different from traditional storage systems? How is RecordsKeeper different from Storj, Filecoin, and Siacoin? How is RecordsKeeper different from Blockchain DB? What kind of data can I publish on RecordsKeeper? What’s the maximum amount of data I can publish on RecordsKeeper? Can I upload an entire file on RecordsKeeper? What are the blockchain specifications for RecordsKeeper? What is the maximum block size for the RecordsKeeper blockchain? How many confirmed tx/sec can RecordsKeeper achieve? What are the use cases of RecordsKeeper? Is data uploaded to RecordsKeeper encrypted by default? Who can retrieve published records? How can I verify published records? What is the cost of publishing records? How can I mine XRK? What are the minimum hardware requirements for XRK mining? What is the use of XRK? What is the value of XRK? Can XRK tokens be destroyed or burned? How many total XRK tokens are in circulation? How can I get Testnet XRK tokens? Do I need to buy XRK to use the Demo? Who gets the XRK which are spent as transaction fees? On which exchanges is XRK listed? How can I purchase XRK in bulk? © Copyright 2018, RecordsKeeper. Revision 37aa0847.